The Trimurti (meaning "three forms" of God), also known as the Hindu Trinity, is an iconographic representation of God in Hinduism, which depicts divinity as a three faced figure. These three faces represent God's roles of creation, preservation and destruction, which are associated with Brahma (the source or creator), Vishnu (the preserver or indwelling-life), and Shiva (the destroyer and transformer) respectively. These three personae are thought to represent different modalities of the one supreme divinity. In this manner, the Trimurti is similar to some interpretations of the Christian Trinity such as Sabellianism. These similarities however should not be carried too far. Beyond the superficial three-in-one commonality, Chrisitian trinitarianism is very different from "Trumurti" in almost all cases save the interpretive scheme of ninth-century philosopher Shankara. This Trimurti concept is a tenet most strongly held in Hindu denomination of Smartism, though it is largely rejected by other denominations, such as Saivism and Vaishnavism. The specific Hindu gods that combined to make the Trimurti (Brahma, Vishnu, and Shiva) each have their own origins in Hindu mythology, scripture, and folklore. However, how they came together in a single iconographic representation is still a source of scholarly interest. According to scholarship, the origins of the Trimurti can be traced back to the the Rg Veda, where the earliest expression of god in three aspects is found. Here, the all-important element of fire is conceived in three forms: in the hearth, it is Agni; as lightning it is Vidyut; and in the form of the sun it is Surya. Later on in the Maitrayaniya Upanishad 4.5, it is reported that meditation upon the One reveals it to be embodied in a series of triadic entities, one of these being the triad of Gods Brahma, Rudra, and Vishnu. By the time of the original composition of Hindu Epics (500-100 B.C.E. ), Shiva and Vishnu had gained a place at the top of the Hindu pantheon. Within the Epics attempts were made to identify Shiva with Agni, the god of fire who is of utmost importance in the Vedas. For instance, in one passage in the Mahabharata the Brahmins claimed Agni to be Shiva. In regards to Vishnu, this god already occupied a place in the Vedic mythology, occasionally being given supremacy as a supreme personal God. His famous appearance in the Bhagavadgita in the form of Krishna only reinforced this reputation. However, in the Epics, the three gods as modes of one greater entity plays almost no role. It is only in the appendix of this work (10660 ff) that the notion of Trimurti is introduced. However, Brahma is largely ignored, whereas Vishnu and Shiva are considered equal parts of an androgynous entity referred to as Hari-Hara, a duad which eclipses the triad in importance. It was not until the arrival of the Puranas, a large corpus of mythical and historical Hindu texts, that the Trimuti became a standard doctrine. The Padma-Purana, a Vaishnava text, explains the origin of the three modalities of the one supreme Vishnu: "In order to form this world, the supreme spirit produced from his right side Brahma. In order to maintain the world, he created from his left side Vishnu. To destroy it he gave rise to Shiva from his middle. Some men worship Brahma, others Vishnu, and yet others Shiva. Since these three are one, the devout should draw no distinction between them." This is the first explicit statement of the three gods' essential oneness as constituents of the supreme principle. However, it should be noted that at no time was the trinity itself actually worshiped. Iconographic representations of the Trimurti first appear around the latter half of the first millennium of the common era. For example, the famous image of the Trimurti statue found on Elephanta island (near Mumbai, India) was carved during the eighth to tenth century. This sculpture has been attributed the imperial Rashtrakutas of Manyakheta (in present day Karnataka), who ruled the southern and the central parts of India this time period, and used the image of the three Gods as their insignia. In this particular image, Shiva is depicted as manifesting all three aspects of the Godhead. It has been suggested that the emergence of the Trimurti was perhaps a deliberate attempt to reconcile the major Hindu deities of the time into one universal Godhead in order to minimize the spiritual competition among devotees, and to promote unity and harmony. From this perspective, the Trimurti, like the Hindu deity Harihara, reflects the deep impetus in Hindu thought towards inclusion and syncretism. Until the creation of the trinity, Vishnu, Shiva, and to a lesser extent Brahma were recognized under varying names dependent upon the particular locality in which they were being worshiped. Eventually, they came to subsume the names and traits of deities with whom they shared a similar nature through the agency of popular poetry or art, among other mediums. For example, considering several of Vishnu's alternative monikers, such as Vasudeva and Vaikuntha, an attempt may be made to identify Vishnu with Indra, another one of the Vedic gods. As these gods rose to preeminence within the popular traditions in various regions, their attributes became coordinate with the powers which had been attributed to Brahma, and they too came to represent the Supreme Personal Being in their own right. Therefore, the three deities, Brahma, Vishnu and Shiva, were to represent a triple Godhead, as it manifests itself in the creation, preservation, and destruction of the universe, respectively. These three forms or faces of the Trimurti represent God's roles of creation, preservation and destruction, which are associated with Brahma (the source or creator), Vishnu (the preserver or indwelling-life), and Shiva (the destroyer and transformer) respectively. Some Hindus use these cosmological functions of the three gods to create an acronym for "GOD"; that is Generator (Brahma), Operator (Vishnu) and Destroyer (Shiva). Iconographic representations of Hindu gods are typically associated with specific symbols and animal companions or "vehicles." Brahma's vehicle is the Swan. Brahma is typically colored red, symbolizing the creative power of the sun. His physiognomy is marked by four heads, four faces, and four arms. Hindu myths explain that he originally had five heads, though the fifth was cut off by Shiva in order to control Brahma's infatuation with Shatarupā, a female deity. Each of Brahma's remaining heads recites one of the four Vedas. He is usually depicted as having a white beard, indicating his status as the elder god. One of his four hands is shown holding a scepter in the form of a spoon, which is associated with the pouring of holy ghee or oil into a sacrificial pyre, indicating that Brahmā is the lord of sacrifice. In another hand, Brahmā holds a mala (string of rosary-like beads) that he uses to keep track of the duration of the universe. He also is shown holding the Vedas, and sometimes, a lotus flower. A fourth hands holds a water-pot (sometimes depicted as a coconut shell containing water). He is said to live in Brahmapura, a mythical city located on Mt. Meru. At one time, Brahma represented the creative power of divinity until this power was supplanted by the great Shakti (feminine Goddess). According to the Puranas, Brahma was self-born (without mother) within the lotus which grew from Vishnu's navel at the beginning of the universe. Alternative stories claim Brahmā to be the progeny of Brahman, the Supreme Being, and his female energy, Maya. Another legend says that Brahmā created himself by first creating water, and then depositing his seed into this water, from which he grew to become a golden egg. From this golden egg, Brahma was born as Hiranyagarbha; hence he is also known as Kanja (or "born in water"). It is said that the remaining materials of this golden egg expanded into the Universe. Yet another aspect of Brahma's mythology states that during creation, Brahmā created ten Prajapatis (Fathers of the human race, as well as seven great sages). Brahma is commonly accompanied by his consort Saraswati, the goddess of learning, harmony and artistic endeavor. Vishnu represents the active caring side of the supreme divinity. Hindus believe that Vishnu incarnates periodically for the protection of righteousness (dharma) and the destruction of evil, and he is most famously identified with his avatars, especially Krishna and Rama. His name literally means "all-pervading one" and likely derives from the story of his measurement of the universe with three strides, described in the 'Vishnu Sukta' of the Rig Veda. Vishnu rose to supremacy in the Hindu pantheon after defeating Indra in mythological lore. The Visvakarma Sukta of Rig Veda (10.82) that tells the story of Brahma's creation, seems to refer to Vishnu indirectly as the Supreme God, since the lotus which spawned Brahma and subsequently the universe originally grew from Vishnu's navel. In the Puranas, this story was reinterpreted to suggest that Brahma merely imagined himself to be the first born, and it is Vishnu who has true authority over creation. Vishnu's rise to supremacy is most apparent in the great Hindu Epics. Perhaps there is no more significant an illustration of Vishnu's power as in the Bhagavadgita, a section of the larger Mahabharata Epic. Here he appears in the form of Krishna, who serves as charioteer for Arjuna, a conflicted warrior. Vishnu's avatar implores Arjuna to follow the path of righteousness and duty without selfish desires. Vishnu is typically depicted as a four-armed male. The four arms indicate his all-powerful and all-pervasive nature. He is always to be depicted holding four talismanic objects: a conch shell (the sound of which represents the primeval sound of creation), a chakra (a discus-like weapon which symbolizes the mind without ego), a Gada (a mace from which mental and physical strength is derived), and a lotus flower (or padma, which represents liberation through dharma). Vishnu is usually colored a blue, which represents the pervasiveness of both the sky and the ocean. Around his neck, he wears the auspicious "Kaustubha" jewel, and a garland of flowers. A crown adorns his head symbolizing his supreme authority. Vishnu is to shown wearing an earring in each ear which represent the inherent opposites in creation, such as knowledge and ignorance, happiness and unhappiness, and so forth. Sri or Lakshmi, the goddess representing beauty and fortune, is the consort of of Vishnu. Vaishnavites (those who worship Vishnu as the superior deity), often claim that nothing is actually destroyed, but rather, the operation of destructive power attributed to Shiva is simply a transformation of matter. Matter, therefore, is never actually annihilated, hence Vishnu's preservative ability is proclaimed to be the ultimate power in the universe. He is also worshiped in the forms of his avatars. Vaishnavism is very popular in contemporary India, particularly in the northern regions, and has also spread beyond India in the form of diaspora of Hinduism and Gaudiya Vaishnavism, which came to North America by way of the International Society for Krishna Consciousness (ISKCON) in the 1960s. Shiva is the personification of the destructive power of the supreme divinity. This destructive element seems to have been inherited from Shiva's precursor Rudra, the Vedic god of death and the wastelands. Despite this characterization as an annihilator, Shiva is viewed as a positive force as creation necessarily follows annihilation, and further that creation at new and higher levels are dependent upon the cleansing force of Shiva's annihilation. In this way, many Shaivites (followers of Shiva) have nuanced the traditional understanding of Shiva, reconfiguring him as the personification of God's reproductive power, an understanding which seems to have supplanted Brahma's importance as the creator. According to devotees, Shiva is not merely a destroyer but performs the functions of creator, preserver, and destroyer, while also performing blessings upon worshipers. Just as Vaishnavas see Vishnu as the Ultimate Reality, so too do Shaivites speak of Shiva. Extrapolating upon these abilities to both destroy and create, Shavite mythology portrays Shiva as the entity which reconciles all polarities observed in the physical world. Hence, Shiva is both static and dynamic, oldest and youngest, virile and celibate, gentle and fierce, and so on. He even reconciles the duality of men and women, taking the form of Ardhanarishwara ("half woman, half man") in order to assert the equality of men and women. In addition, he is said to be omnipresent, residing in every living being as pure consciousness. Like Vishnu, Shiva is not limited to personal characteristics and can transcend all attributes and iconographic representations. With this in mind, Hindus typically depict and worship Shiva in an abstract manner, often in the form of the Shiva linga (or lingam), a phallic clay mound or pillar bearing three horizontal stripes. Shiva is commonly pictured in deep meditation upon Mount Kailash, his traditional abode located in the south of Tibet. Shiva's body is smeared with cemetery ashes representing the fact that death is the ultimate reality of the life. For this reason Shiva is typically colored white. A third eye on his forehead represents his ability to look beyond the obvious, as well as his untamed energy which destroys evil doers and their sins. Shiva also bears on his head the crescent of the fifth day (panchami) moon. This represents the power of the sacrificial offering, as well as his control over time. Shiva wears tiger, deer and elephant skins to indicate his control over lust, pride and the mind, respectively. Further, a deadly cobra worn around Shiva's neck illustrates that he has conquered death. Shiva also carries a trident, an instrument which metes out punishment to evil-doers on the spiritual, subtle and physical planes. The three prongs also represent the creative, preservative, and destructive functions of the divine triad, while the Trident itself in the hand of Shiva affirms that all three aspects are ultimately under his control. Shiva is inseparable from his consort Parvati (who is also referred to as Shakti), as the two are considered to be one within the absolute state of being. Thus, Shiva is said to share half of his body with Shakti in his form as Ardhanarishwara. 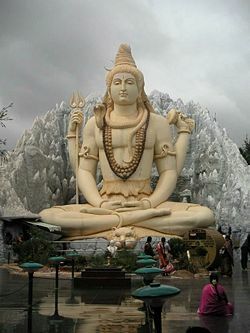 Shaivism is the most popular branch of Hinduism practiced in South India today. The Trimurti has been interpreted in many different ways, particularly in relation to cosmology. A widely accepted belief is that the three gods seen together represent earth, water, and fire. The earth is seen as the originator of all life and hence is regarded as Brahma. Water is seen as the sustainer of life and is represented as Vishnu. Fire consumes or transforms life and is therefore considered to be Shiva. Alternatively, the three members of the Trimurti are conceived to be analogous with the three planes of consciousness: On the spiritual plane, the spiritual element is represented by Brahma, the psychic element by Vishnu, and the physical element by Shiva. On the psychic plane, Brahma epitomizes intuitive and creative thought, Vishnu is intelligence, and Shiva represents emotion. On the physical plane, the sky is Brahma, the Sun is Vishnu and the Moon is Shiva. Various phases of an individual’s life are said to be represented by the Trimurti. The first of these phases, that of celibacy and studentship (Brahmacharya Ashram) is represented by Brahma. During this phase, knowledge, represented by Brahma's consort Saraswati, is the individual’s constant companion. The second phase of adulthood and householders (Grihastha Ashram) is represented by Vishnu. During this phase, the individual fulfills all religious and family obligations by becoming involved in generating wealth, which is then used to sustain the family. During this phase wealth is the individual’s companion and is represented by Vishnu’s consort, Goddess Lakshmi. The third phase is that of old age (Vanaprastha Ashram) and is represented by Shiva. This phase marks the renunciation of the material world for an austere life dedicated to the pursuit of true knowledge. In ancient days, this typically marked the time when a householder, along with his wife, left his worldly belongings to live in a forest with only essential belongings, just like Lord Shiva. In the final phase (Sanyasa Ashram) the individual seeks merger with the Supreme power (Isvara). The three phases of life, then, just like the trimurti, culminate into a transcendent One, bolstering the idea that the three gods are in reality one and the same Isvara. The philosopher Shankara (c. 788–820 C.E.) provided another cosmological interpretation of Trimurti. In his view, Shiva represents the Nirguna Brahman (or Brahman without features), Vishnu the Saguna Brahman (Brahman with features) and Brahma the Cosmic Mind. In more philosophical terms, Brahma is associated with Divinity's Creative Ground of Being, while Vishnu is said to be associated with Divinity's Emanated Idea (Logos, Wisdom, or Word), and Shiva is said to be associated with Divinity's Transformative Energy (Flame, Breath, or Spirit). The concept of Trimurti is most strongly held in Smartism, a contemporary denomination of Hinduism. Smartas, who follow Advaita philosophy, believe that deities such as Vishnu or Shiva are various forms of one ultimate higher power ("Brahman"), which has no specific form, name, or features. The forms of the deity serve as a heuristic purpose in that they provide a physical form for the supreme divinity which is inconceivable. These conceivable forms of divinity allow Smarta followers to narrow their focus during worship and meditation, thereby assisting their spiritual progression toward the great, ineffable divinity. Vaishnavism and Shaivism, however, believe respectively that Vishnu (and/or his avatars) and Shiva are the superior, personalized forms of god, with all other representations paling in comparison. Whether it be Shiva or Vishnu that they worship in personalized form, the one god is seen in both traditions to ultimately transcend all personal characteristics, essentially embodying the monistic essence of the universe like the classical conception of Brahman. Although Vishnu and Shiva as have each spawned their own monotheistic devotional tradition, Brahma still remains in relative obscurity. Today Brahmā is almost totally ignored by Hindu devotees, while Vishnu and Shiva continue to be worshiped en masse. Modern India has but two temples dedicated exclusively to Brahma, in contrast to the thousands of temples dedicated to the other two deities in the Trinity. The most famous of the Brahma temples is located at Pushkar in the Rajasthan state. The other temple for Brahma is located in the town of Kumbakonam, (Thanjavur District) Tamil Nadu. Thus, Brahma is no longer as relevant as he once was in Hindu writing, as the focus upon other generative deities, such as Shakti, the Divine Mother has supplanted Brahma as the Source/Creator. As is the case with followers of Vishnu and Shiva who view their own God to be the embodiment of all three divine personas, Shakti worshipers believe the three deities emerge from the Divine Mother, and they are merely aspects of her nature. ↑ Although such attempts at an identification of the two gods remained isolated, they would suggest that, in adapting their speculations to the actual state of popular worship, the Brahmans kept the older Vedic triad of Soma, Agni and Vayu distinctly in view, endeavoring to bring their new structure into harmony with the ancient Vedic beliefs. ↑ Vishnu's place in Vedic mythology is by no means one of such prominence as would entitle him to the degree of exaltation he received as one of the three hypotheses of the divine. There is also some question as to the links between the Vedic Vishnu and Vishnu as he has been commonly known within the Trimurti. Although his general nature within the Vedas as a benevolent, genial being corresponds on the whole to the later Vishnu, the later Vishnu exhibits many important features which are not found within his prototype, and were most likely attributed to him from an amalgamation with regional deities. However, there are several Vedic verses that do utter the view that Vishnu does indeed have supremacy as a personal God. This page was last modified on 17 December 2015, at 16:10.